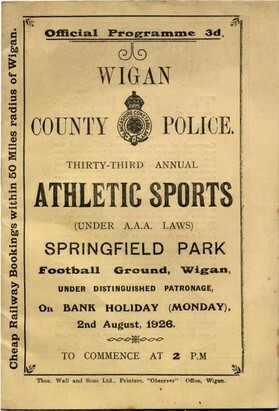 In September 1919, Wigan United Football Club joined the West Lancashire League alternating their initial matches between Springfield Park and the Honeysuckle Ground in Poolstock . By November 1919, United had secured the lease for Springfield Park and the club used the ground for all its home games. The enclosure was said to be “spacious and easy to get to”, but spectators had to endure poor facilities as the ground had not been used extensively during the war years. The club did however, erect new dressing-rooms. At this time, a season ticket cost 7/6d (37.5p), while supporters who paid at the turnstile were charged 6d (2.5p). per game (3d. for juniors). As usual the path of football in Wigan was not an easy one as United followed in the footsteps of Wigan Town by angering the Lancashire FA. United were an amateur side and because of this status they were not allowed to pay their players, a rule which was apparently broken. The directors were told that they would have to stand down and United would have to turn professional. On October 31st 1920, Wigan United played their last game – against Darwen - before a public limited company was created. As United were in effect no longer in existence, another name was required for the “new” team. Wigan Association Football Club took over the fixtures of the former tenants playing under that designation for approximately three weeks, when the F.A. agreed that all their demands had been adhered to, allowing the club to become officially known as Wigan Borough Football Club. Borough’s first game at Springfield Park was on November 21st 1920, when 4,000 spectators watched a 2-2 draw against Bacup Borough. A poor start was witnessed with the first victory arriving at Springfield Park on January 2nd 1921 when Horwich R.M.I. were beaten by 2-0. Towards the end of that month, Borough announced their intention to apply for membership of the Third Division (North) of the Football League. They were elected at a Football League meeting in March 1921. September 3rd 1921 became a historic day when Springfield Park hosted it’s first ever Football League game. Nelson were the visitors, being victorious by 1-4, with an attendance of 9,000. In August 1922 the Wigan Observer reported that, " .….much voluntary and exceedingly useful work has been put in by the members of the Supporters Club and other enthusiasts, and Springfield Park presents a much improved appearance in consequence. The hoardings have been raised in several places where before it was possible for the matches to be seen from outside the ground, whilst the raising back of another portion enables the crowd to pass from one set of turnstiles to the other without first going into the streets. The playing pitch has received a lot of attention also, in addition to the turf having been brought to a splendid state, the ground now benefits from an additional training facility. The registered offices have been moved from Wallgate to Springfield Park, and the manager, Mr Bamblett, will have better supervision of the players. The referee’s room has been transferred to a place under the stand. Along the front of the stand a red ash cinder track has been laid and provides grand facilities for sprinting practice". Thirty-nine men lost their lives at the Haig Pit, Whitehaven on September 5th 1922. Springfield Park was chosen to host a game between Newcastle United and Cardiff City on October 2nd after a Mayors Fund was opened to "place the relatives beyond the reach of poverty". Because of the mining links with Whitehaven, 15,000 people paid to watch The Bluebirds win 4-0 creating a record attendance for the ground in very sad circumstances. As Borough did not enter the F.A. 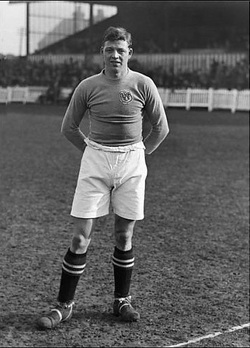 Cup in 1921, the ground had to wait until the next season to stage an FA Cup tie. The first match was against Eccles United on November 18th 1922 in the 4th qualifying round. Borough won 4-0. The early 1920’s was a golden age for Springfield Park. The original stands were replaced; a new Main Stand was constructed, followed by the Shevington End Stand and finally the Popular Side Stand, which ran from the half-way line towards the Shevington End. The Popular Side Stand was built in the close season of 1924 from funds raised by the Supporters Club. Crowds rarely dropped below 7,500 and Borough set the ground’s record League win on March 3rd 1923 when Lincoln City were beaten 9-1. Towards the end of the decade Wigan Borough drew the current Football League Champions, Sheffield Wednesday, in the F.A. Cup and provisions were made for the tie, which was expected to set a record attendance. The banking was raised behind the Town End goal, crush barriers and thirteen extra turnstiles were installed. On the day of the match, January 12th 1929, the gates were opened at 12 o’clock and the official attendance was given as 30,443. The largest attendance for a Football League match at Springfield Park was recorded on April 1st 1929 when Borough overturned Stockport County 4-0 before a crowd of 15,500. Both gates stood when the ground was demolished in 1999.